Not all 25-year-olds know what their life calling will be, but for Brittney Lanosga, that calling revealed itself well before her quest to bring clean water to the Philippines following Super Typhoon Haiyan began, she just hadn’t realized it yet. Super Typhoon Haiyan, which devastated the island nation in November 2013, was possibly the strongest storm in recorded history, the damage left in its wake was catastrophic; thousands were left homeless and without access to clean drinking water. While taking a seminar back in December, Lanosga and her peers were instructed to create a project that would benefit a community. The result? Her founding of Water Well Wishes (WWW). WWW is a campaign designed to raise money for Children International—a foundation also involved in the disaster relief efforts, in the Philippines. But it wasn’t just a fascination with water that led Lanosga to spearhead the project, as her late grandfather and a quest to connect back to her ethnic roots served as inspiration. “I’ve always been the oddball in my family, I’m the only one who has carried the looks of Philippinos. I didn’t know what I was, and we didn’t have any of that [Philippine] culture,” she explained to me. After graduating with two bachelor degrees, the University of Iowa graduate is heading back to school for environmental science. Water-born diseases such as typhoid, cholera, and giardia are common in unsanitary conditions and after natural disasters, and prove fatal when left untreated. According to Children International’s website, one-in-eight people don’t have access to clean drinking water, and 4,000 children around the world die every day from water-related illnesses. 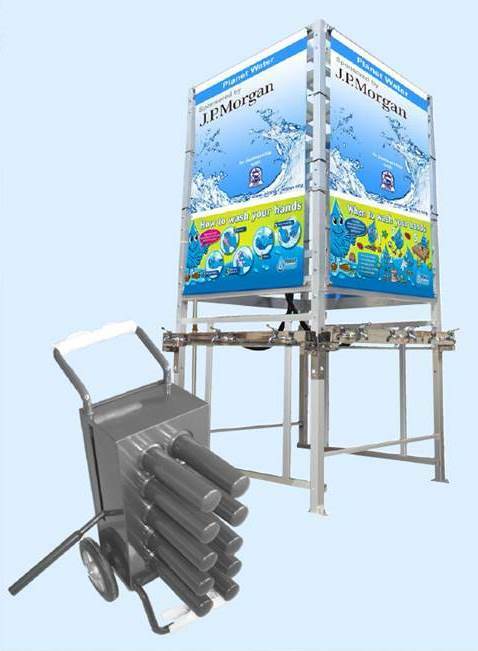 The emergency water system is composed of two parts: A four-legged metal structure with water faucets is installed in the affected area; a portable filtration system is also brought on site that filters the water in a five-stage purification process. From the structure hang large banners with pictures that instill the importance of good hygiene and instruct people on how to wash their hands properly. The portable filtration system is only for emergency situations and can be moved to different locations thanks to its relatively small size and attached wheels. WWW’s website has been up and running since January 2014 with a goal of raising $10,000 by April 1. After a successful fundraising event in Chicago that exceeded capacity, Lanosga is confident that the campaign will reach its mark—and possibly exceed it. The current amount is $8,238, and their progress can be seen on the website. All proceeds from WWW are funneled directly to Children International, which serves as the umbrella organization. Much to Lanosga’s surprise, the foundation and its campaign have gained tremendous momentum. “I didn’t even think it was going to get to the point where I was going to make a non-profit out of this. I just figured it was going to be a one-and-done thing,” she confessed. Not only did she make a recent decision to turn WWW into a non-profit, but she also hopes to work with more than just emergency water systems, such as single-person filtration systems. She has plenty of ideas and resources to tap into, and the idea of helping disaster relief programs within America’s borders is a possibility, as well. With so much recent attention, it’s easy to feel overwhelmed. It hasn’t always been easy, though. Trying to stay in contact with Children International’s team in the Philippines has proved difficult at times, and she has yet to contact the Philippine government about her campaign and potential non-profit. Lanosga’s fundraising team, although small, is comprised of very energized and motivated people—many of them only in their twenties—who want to be a part of something bigger than themselves and make an impact. Her project leaders, as well as family members, have been very supportive of her efforts along the way. Just like the water she loves, Lanosga is committed to going with the flow.